My oldest son was recently assigned a “Patriot Report” to write for school. Each child in his class has a historical character to write about, and my son was assigned John Adams. 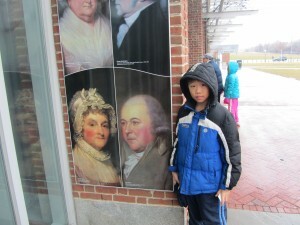 Since we live in NJ, we thought it might be cool to drive the hour and a half to Philadelphia, and give him some hands on knowledge of the life that John Adams lived, where some important documents were debated and created, and essentially give him a greater understanding of the process of creating the system of government we know in the United States today. In fact, we decided to spend the weekend. In fact, it’s where I found our hotel. 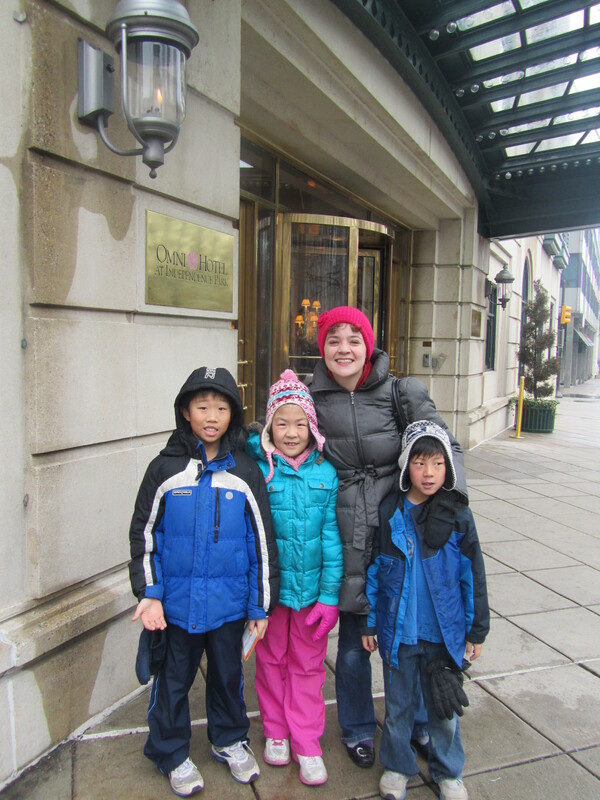 We wound up staying at the Omni Hotel which is on Chestnut Street. I can’t begin to say enough good things about this hotel. We chose it for its location…it’s practically across the street from the Liberty Bell, Independence Hall, etc, and within walking distance of many attractions. But what really blew me away was the service. I could not get over how incredibly happy and helpful the staff was. I spend a LOT of time in hotels, and this was really exceptional. From the Front Desk to the Bell Staff who checked our bags when we arrived early to the Concierge who on her own initiative had typed up a list of kid friendly restaurants in the area, they just went above and beyond. 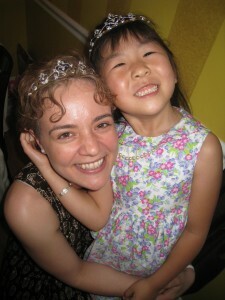 They remembered my family after meeting us for the first time, and would ask us how we were enjoying the sites. They offered wonderful little backpacks of kids’ activities that kept my kids busy. The little indoor pool was just big enough for my kids to enjoy without being huge or hard to supervise. In short, it was just a lovely place to stay that I will always choose when we return to Philadelphia. 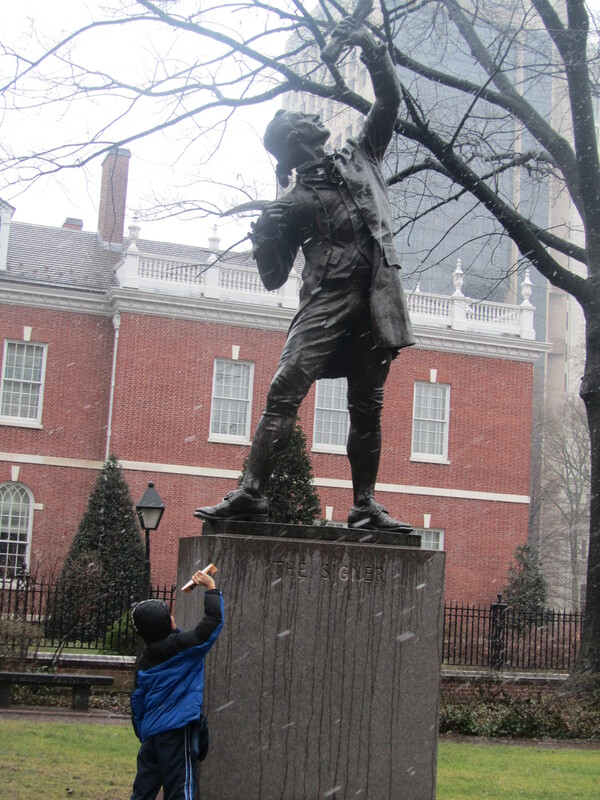 Now all the historic sites in Philadelphia are maintained by the National Park System. And the rangers are absolutely wonderful. Everyone was so friendly, and made a point of sharing the history of each of the places we visited. 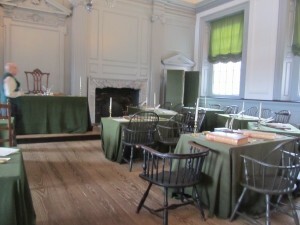 They also made sure we knew how to get where we needed to be on time, so we could take advantage of all the free tours. We got to see the ink well used to sign the Declaration of Independence, got to see the halls where the first and second Continental Congresses debated (and where John Adams was inaugurated as our 2nd president…the first peaceful transfer of power in our country under our system of government), and really enjoyed seeing the halls where Benjamin Franklin, Thomas Jefferson, John Adams, George Washington, and many other men of great vision walked and shaped our country. 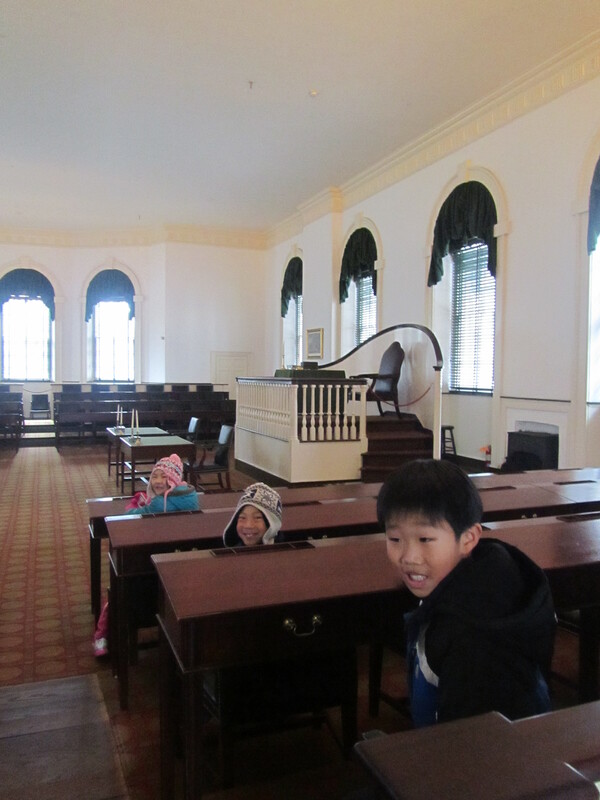 Did you know that George Washington sat in a chair that had a rising sun on the back? Benjamin Franklin said at one point that he didn’t know for a while whether that sun was rising or setting on our new country. But eventually he could tell that it was rising, and he was happy. And Benjamin Franklin had a special chair because by this time he was sick, and inmates would carry him daily to the hall for the congress, and then carry him home. Interesting facts. We also found out that the Park Service has a set of trading cards that kids can collect of famous characters and landmarks. After visiting, and sometimes answering questions, the kids could get additional cards. They LOVED this part! After our visit to these historic sites, we headed over to the Liberty Bell. Yep, it’s got a big crack in it alright! 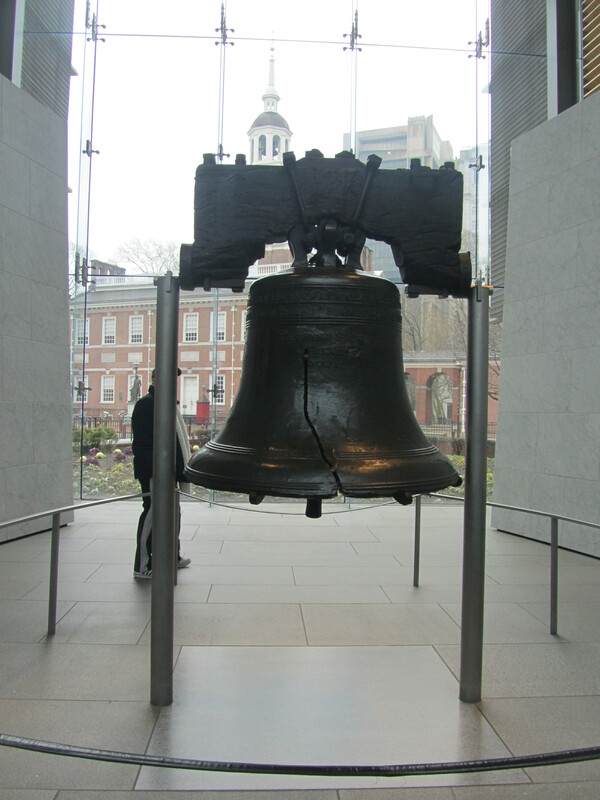 🙂 This is the bell that was used to call people to the square in front of Independence Hall for a public reading of the Declaration of Independence, and other important documents. Then we headed over to the Bourse building where you can fuel up on snacks from a variety of vendors in the food court, and check out the various gift shops on the same level. Quick note though…we let the kids look at the gift shops on Saturday, planning to come back and make purchases on Sunday. That’s when we learned that the Bourse is closed on Sundays in the winter. Bummer. Now if it had been summertime, we could have headed over to Franklin Square, which has all kinds of fun things like a carousel, mini-golf, etc. But none of that was open in the winter. So instead we took a 30 minute horse and carriage ride through historic Philadelphia. We were lucky…they don’t run all winter, but because it’s almost Valentine’s Day and President’s Weekend, they were starting to run again. It was a fun way to see a few sites that were beyond walking distance for little legs. Since we were in Philly, my husband and I felt it was our patriotic duty to have an authentic Philly Cheesesteak. We asked a few shopkeepers where they would recommend, and it was unanimous: Sonny’s. We got the classic with Cheese Whiz and fried onions. The kids had chicken nuggets. They were REALLY good and we totally enjoyed them. Plus, it was only a few blocks down on Market Street, so we could walk there. Then we headed back to the hotel and spent some time in the pool. The kids were pretty tired at that point, so it was good to relax a bit. Then in the evening, I headed down to the wonderful concierge in the Omni Hotel and asked her what we could do with the kids that evening. Unfortunately in the winter, there’s not much. 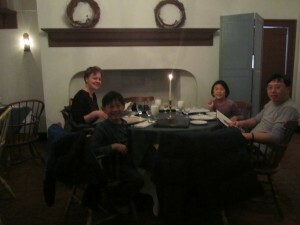 But she did suggest the City Tavern for dinner, and I’m SO glad we went there. Called the “most genteel tavern in America” by John Adams, this famed establishment served as the unofficial White House during the Revolution, and it’s where the Continental Congress gathered after long days of debate. The staff dresses in colonial costumes, the food is based on colonial times (there’s a kids’ menu! ), and it’s so darn adorable. Lots of little rooms with tables in each, colonial decor, and music (there was a harpist that played in the hallway outside our room the whole time we were eating, and there was a violinist who entertained the upper floors of the restaurant.) You can sample Thomas Jefferson’s and General Washington’s original ales, although I opted for the Wassail, that was delicious. 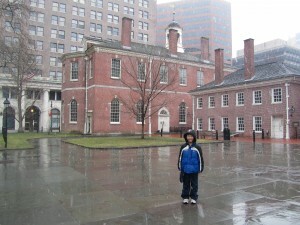 If you’re in historic Philadelphia, make a point of checking out the City Tavern. Kid friendly, and you’ll enjoy it! The next day, we spent the morning at the hotel pool, and packed up. Then we headed out again. 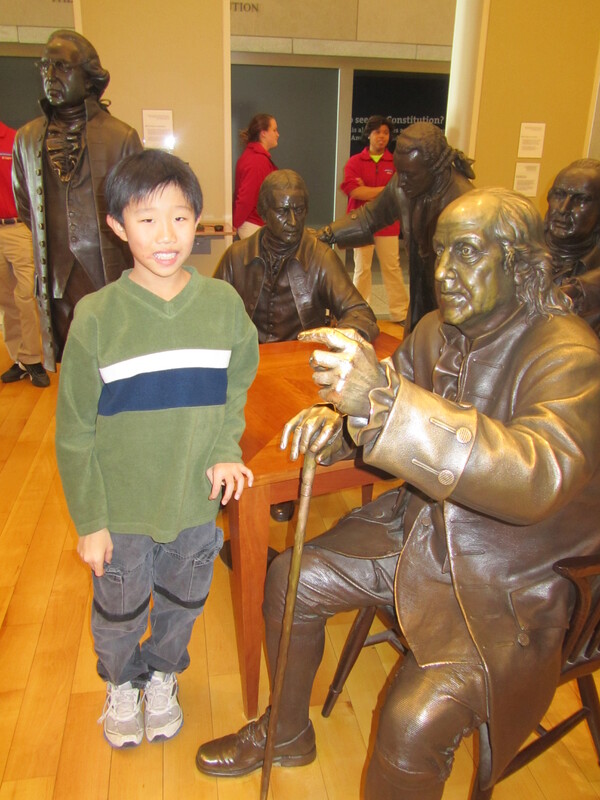 First we went back to the Independence Visitor’s Center for lunch. (We had planned to go to the Bourse building for lunch, which is when we discovered it was closed on Sunday.) If I did it again I’d probably go east on Market Street and eat at one of the restaurants there, but the kids were hungry and it was pretty cold, so we just stayed where we were. After eating, we caught the free movie in the visitor’s center, which was excellent, and then we let the kids make some purchases in the gift shop. 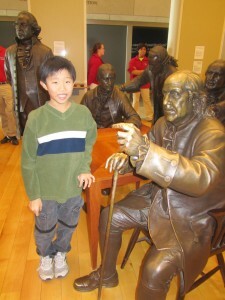 Then we headed over to our last stop of the day…the Constitution Center. We had 1:30 tickets for their award-winning performance “Freedom Rising.” Be sure to check your coats when you arrive. It’s free, and saves you from having to carry them all over. We had a few minutes before the show started, so we started in Signer’s Hall, which contains bronze statues of all the signers of the Constitution. 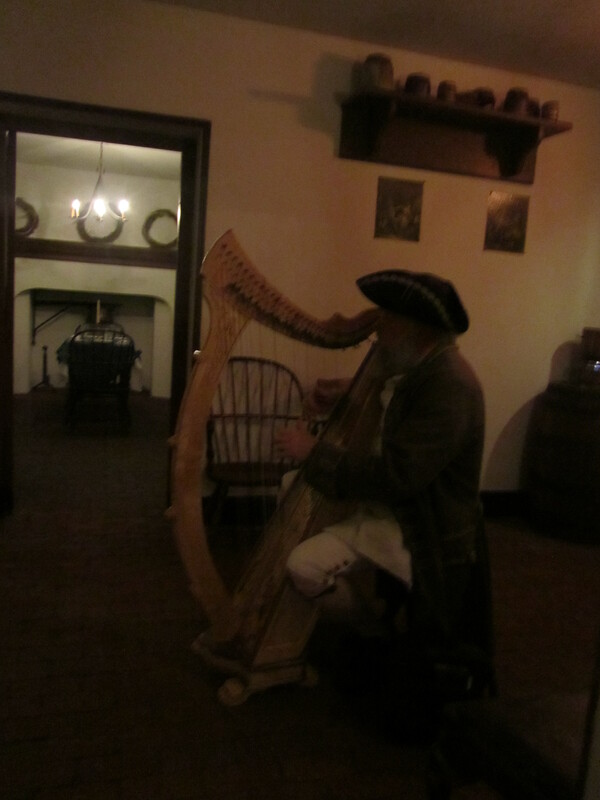 Unfortunately, John Adams was away at the time in England, so he wasn’t among them. 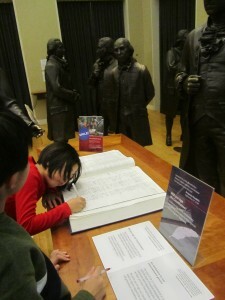 But the kids took pictures with some of them, and got to sign the constitution themselves as part of the display. It was fun. Then we headed down to the performance, which was really excellent, and put the Constitution in a historical context that was as moving as it was fascinating. Finally, we exited the performance into the exhibit hall upstairs, which is highly interactive and super fun for the kids. So many ways the Constitution has shaped our country, and it’s fascinating to learn how important this document is. When we were done, we headed back to the hotel to collect our bags and make the drive home. 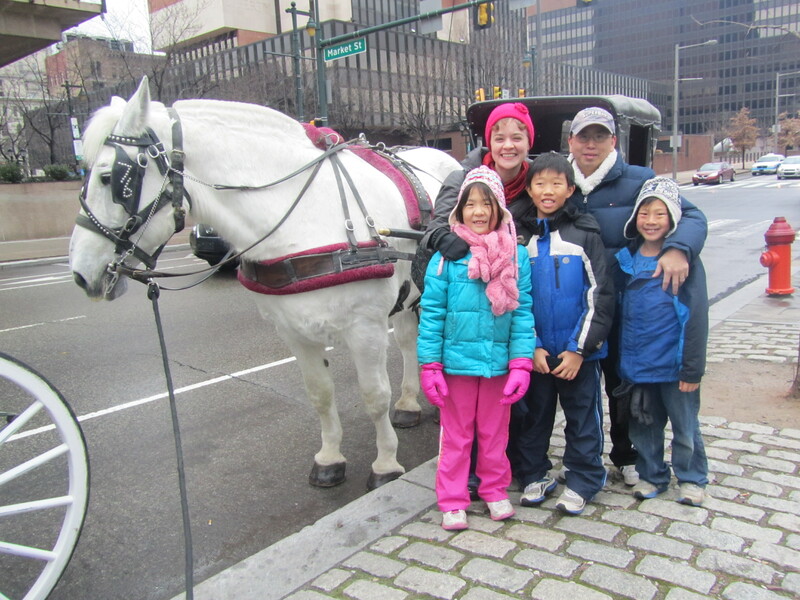 It was a great weekend to be together, learn some history, and take a step back in time. And because it was winter, I’m betting it wasn’t as crowded as it would be in warmer weather. If you get the chance to go, you should! We thoroughly enjoyed it. Find lots of great itineraries at VisitPhilly.com. 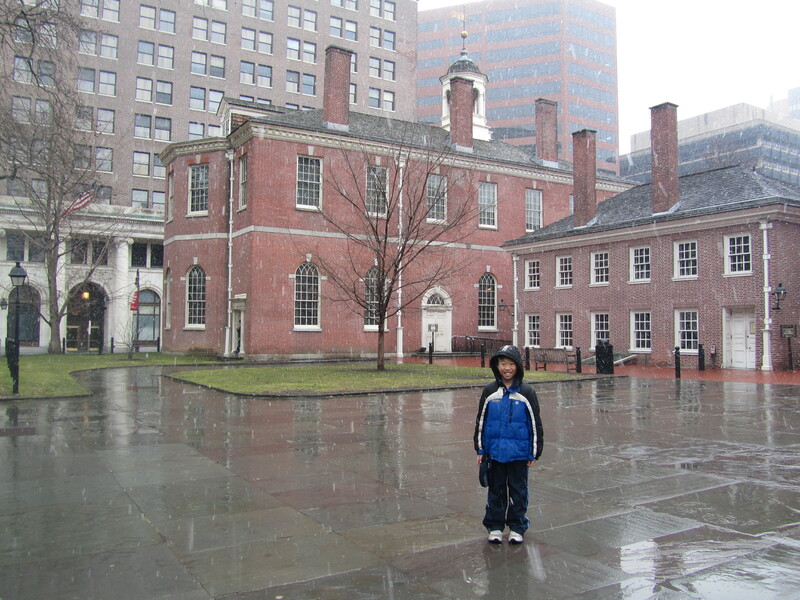 We planned our itinerary using their “A Weekend in Historic Philadelphia…with Kids” itinerary. Traveling as much as I do, I can’t always eat as well as I want to. We all know conference food isn’t healthy (and I speak at a lot of conferences) and the office lunch that they order in when I come for an all-day consulting meeting isn’t exactly high on the list of health food either. Add to that airport food, which varies dramatically depending on where you fly, and I found when I first started traveling that I was putting on weight. Not good! I’ve since learned to take control in a few ways. I always make and pack the next 2 meals I’ll eat, and put them in an insulated lunch tote that fits over the handle of my rolling suitcase. (I got mine from Thirty-One, and I can’t live without it!) For breakfasts, I’ll make an egg white and cheese sandwich on a whole grain English Muffin (the 100% Whole Wheat ones from Fiber One are my favorite) with fruit, and lunches or dinners are often hearty spinach salads with chicken, fruit, and nuts. I pack my sneakers. I always try to hit the gym or a nearby running trail in the morning before my meetings. It gives me a burst of energy for the day, and it also helps to offset any of the bad food I’ll inevitably wind up eating. By eating right at home and on the road, as well as running 4-5 times per week, I’ve taken off 20 lbs in the last 4 months. But I also like it when restaurants I see everywhere help me make good choices. And Starbucks has recently launched a line of “Bistro Boxes” that help me do that. Instead of plastic-tasting, calorie-laden fast food choices, these are real food. I’ve tried the Chicken Lettuce Wraps (360 calories) and the Sesame Noodles (350 calories), and they are both awesome, packed with veggies, and delicious. And each one comes with a cute little bite-sized square of dark chocolate to complete the meal. Filling, healthy, delicious. Starbucks really scored a home run with these. 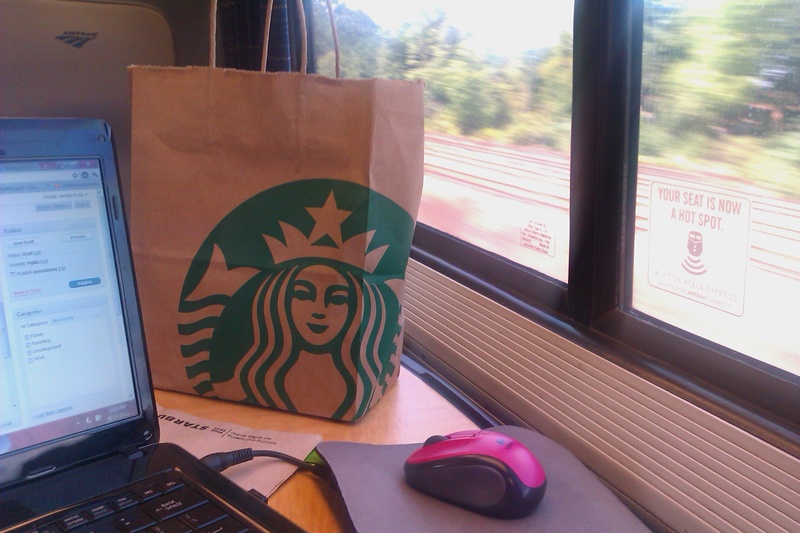 How do you eat healthy on the go? How do you plan ahead? What are your healthy go-to spots when you need a good meal while you’re out and about? Would love to read your ideas and tips in the comments! p.s. This is an unsolicited product review. Just my own 2 cents about products I love.